It's starting to look more like autumn around my house, and we're so excited!! My daughter knows the names of the different seasons and that winter is cold and summer is hot, but was asking what exactly happens in the fall. I explained that besides the weather getting a little cooler, the biggest change would be that the leaves change color and fall off the trees. She has been having a lot of fun helping me get our fall and Halloween decor put up throughout the house, and wanted to make something herself that we could put up with the other decorations. Of course I said yes, and we decided that you can never have too many wreaths!! 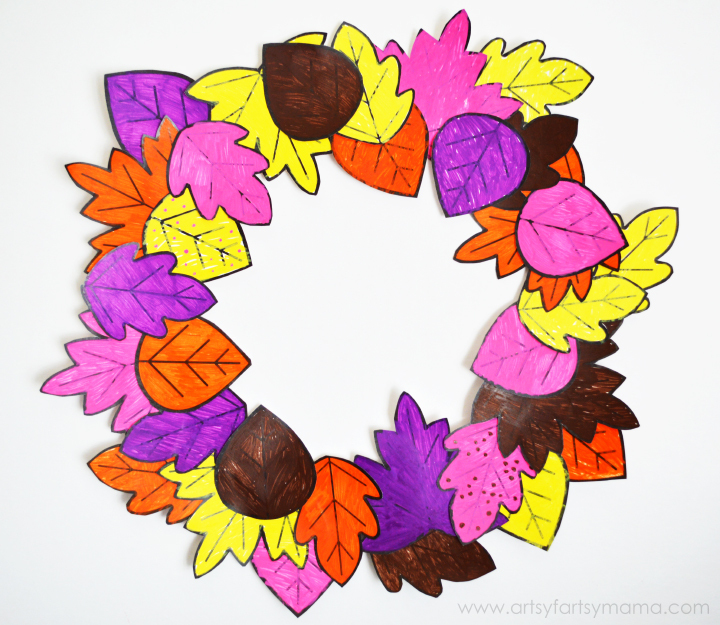 This Kids DIY Autumn Leaf Wreath is simple enough for kids of any age to make, and is something can do with your kids after school and on the weekends that wouldn’t take up too much time. 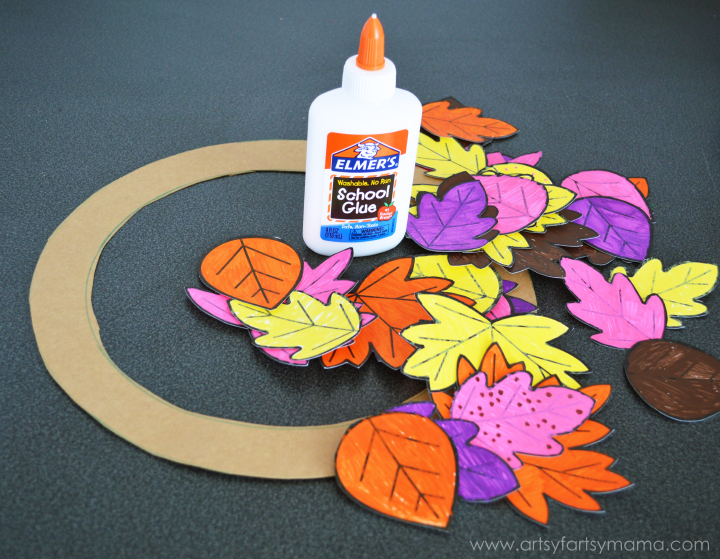 To make our wreath, you'll need my free leaf printable, Painters® Paint Markers (though any markers/crayons/colored pencils could work), and Elmer's School Glue. You'll also need some scrap cardboard for a wreath form. 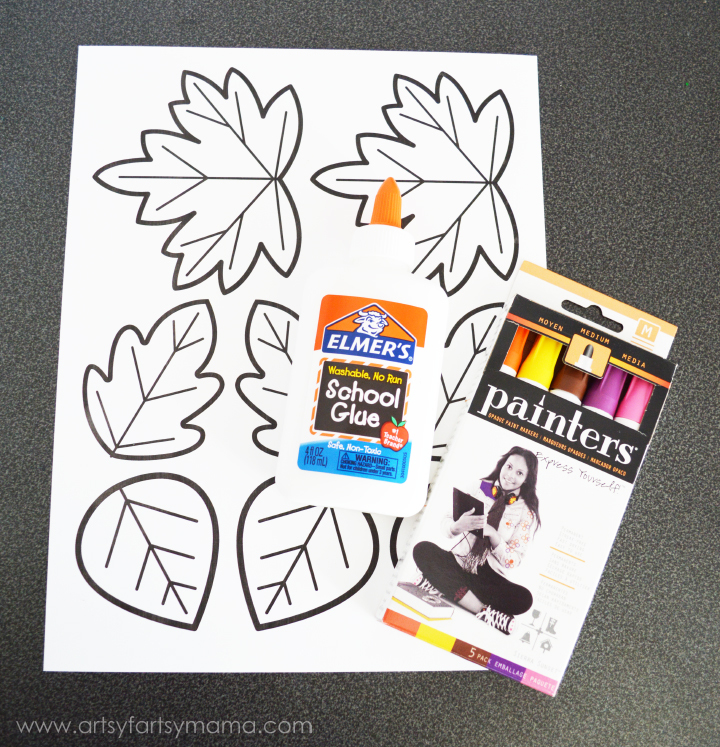 I printed out a few copies of the free leaf printable on cardstock, and let my daughter color away with Painters® Paint Markers (Sierra Sunset). Even though you can use any markers/crayons/colored pencils, I especially love the Painters®. They are opaque, acrylic paint markers that are perfect for decorating, drawing and personalizing almost any surface, and most importantly: they didn't bleed through the paper AT ALL and dried quickly!! 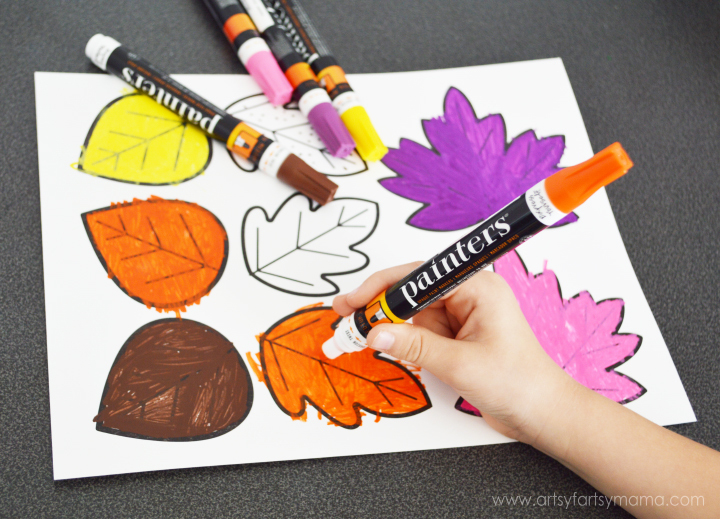 Once you're done coloring all the leaves, you and/or your child can work on cutting them all out! Depending on the size of your wreath, you may end up with extra leaves or you'll need to make more. Our wreath ended up being about 12 inches, and we colored 4 pages of leaves. Your wreath form doesn't have to be perfect!! I traced a couple of bowls onto the lid of a thin cardboard box (almost like a cereal box thickness) and cut it out with scissors. While I was cutting, I had my daughter sort the leaves by size into separate piles. 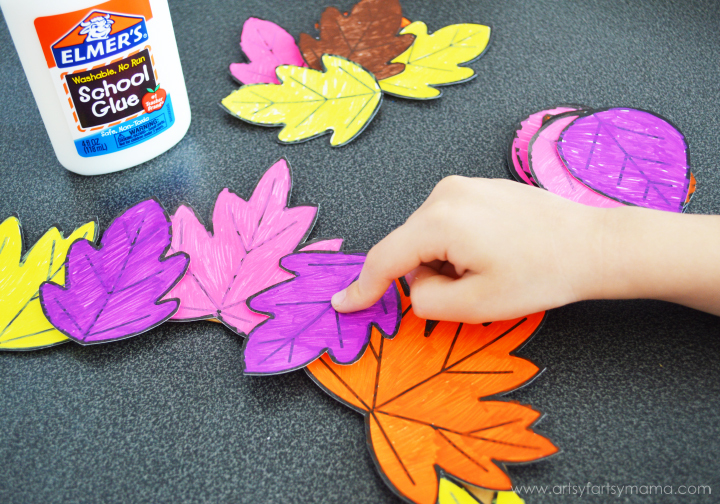 Starting with the largest leaves, I showed my daughter how to use the Elmer's School Glue so she could handle the project all on her own. She absolutely loved being so independent with it and did a fantastic job! 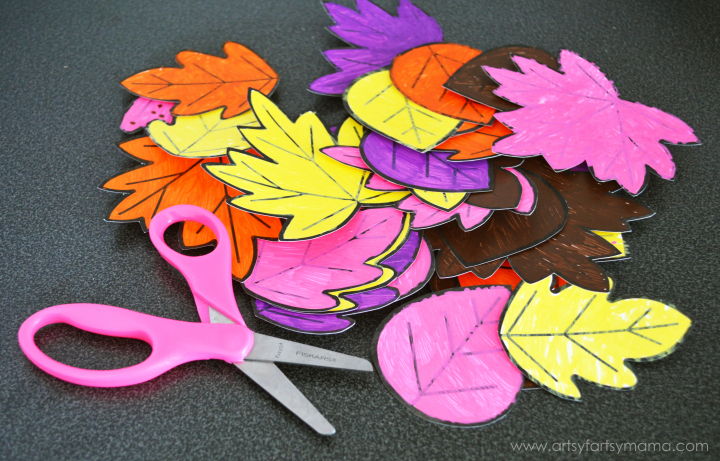 Glue the leaves on however you like, but I found adding them from largest to smallest was the easiest way to go. Once the large leaves are glued down (depending on how much glue you put on, you might need to hold them in place for a little bit), start adding the other leaves until it's covered and you can no longer see the wreath form peeking through. 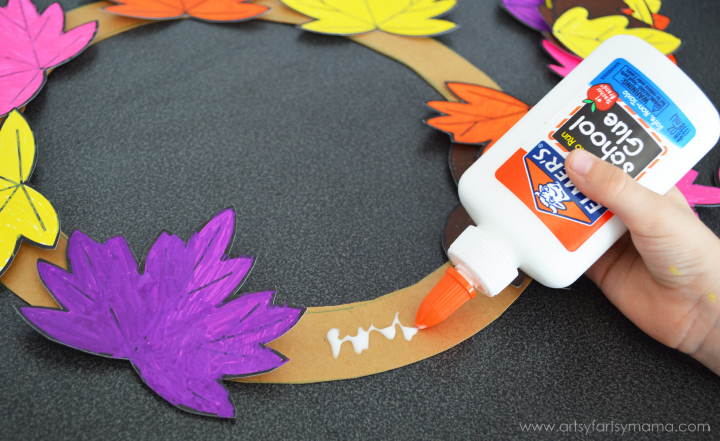 Let the glue dry completely, then your wreath is ready to put on display!! We had a lot of fun making this wreath, and it was nice spending some bonding time together and being creative. What are you looking forward to this fall?? I am part of the Elmer's Crafty Mamas Blogger Crew and have received supplies and compensation, but the ideas and opinions are 100% my own. Such a fun and festive project for little ones! Oh, we could definitely do this one! All the supplies on hand, and the skill level suits the younger ones! What a great project for kiddos! Thanks so much for sharing!